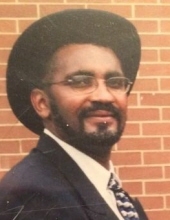 Celebrating the life of Thomas "Tom" Garnett Jr.
Obituary for Thomas "Tom" Garnett Jr.
Mr. Thomas Garnett, Jr. entered into eternal rest on Friday, April 12, 2019 at his residence. He was born on Sunday, May 22, 1955 to the late Mr. Thomas Garnett, Sr. and to Mrs. Ludell Garnett in Columbia County, GA.
At an early age, he joined the Lampkin Grove Baptist Church of Appling, GA. As a student, he attended the Columbia County School System of Georgia, and was a 1974 graduate of the Harlem High School, Harlem, GA. He enlisted into the U.S. Air Force and served proudly for several years. Thomas, Jr. was a lover of all sports, and he enjoyed a good-steak served with rice and gravy along with a slice of pound cake and a glass of kool-aid or lemonade. “Tom” as he was affectionately known, was a compassionate servant of people. His willingness to help others, his uniqueness in making others laugh, and his dedication and commitment to his family, especially his mother will be greatly missed. He gave God the glory for blessing him with a successful Lawn Service Business. He believed that his work should reflect 1 Corinthians 10:31 “So whatever you do, do it for the glory of God.” Not only was our beloved Thomas “Tom” Garnett, Jr. was a precious son, a loving brother and a very important limb in our family tree. His presence in our daily lives will be truly missed more than words can say. The times we’ve shared together and the undying love that we have in our hearts for him shall be with us as long as we live. We understand through Christ that everything is done in God’s perfect timing, and we shall meet again! Left to cherish his memories are: a loving, caring and devoted mother, Mrs. Ludell Garnett of Appling, GA; three sisters, Ms. Mary Garnett of Appling, GA, Mrs. Tina (Mr. Lemithes) Germany of Evans, GA and Ms. Sara Thompkins of Hephzibah, GA; three brothers, Mr. Page Garnett, Mr. Edmond Garnett and Mr. Daniel Garnett, all of Appling, GA; two uncles, Mr. Bertha Garnett of Appling, GA and Mr. Williard (Mrs. Mozelle) Garnett of Los Angeles, CA; a host of nieces, nephews, cousins, other relatives and friends. To send flowers or a remembrance gift to the family of Thomas "Tom" Garnett Jr., please visit our Tribute Store. "Email Address" would like to share the life celebration of Thomas "Tom" Garnett Jr.. Click on the "link" to go to share a favorite memory or leave a condolence message for the family.